Perfectly timed to help me along while working on the upcoming Marvel Update, it seems that the Spider-Man Animates Series is available for free online! 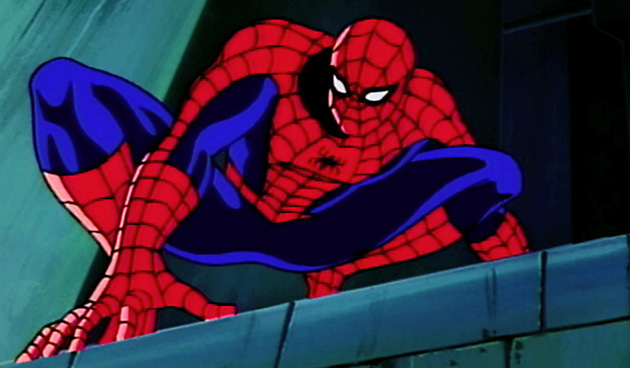 Spider-Man: The Animated Series was originally shown in the 1990s on Fox. I’d watch it every day after school and dance around in my footy jammies pretending to have webshooters. Featuring a variety of Marvel cameos, from the Black Cat to Punisher and the Avengers, the show was the primary medium for my early Marvel education. Now you can see 65 episodes of the series online at the above link. There’s also a single episode of the 1967 series up. Thank you so much for sharing this. I look forward to seeing the Lizard again (the only character I vividly remember). Go Spidey! This is pretty cool, since it doesn’t seem Marvel plans to release the complete series on DVD anytime soon. Do they have any other series, like Fantastic Four or Iron Man? I did a little investigating, and the Marvel website has all the episodes of the 1996 Hulk show, the Silver Surfer and Avengers shows, and the Fantastic Four show from the 2000s. Hey, do you know if they changed the intro on this? It’s got a different song than I remember, I think. And I don’t remember the 3d. Maybe I’m just remembering things oddly. I distinctly remember the intro being changed partway through the series, and it seems that the early episodes have this second version at the beginning on Marvel’s website. You can tell because there are clips from much later episodes, featuring the Punisher, the giant Spider-Slayer thing, more 3D effects, etc. One of the best cartoons in the 90’s. IMHO, even with today’s cartoon standards, this is still the best. I hope Marvel release this on dvd when the new Spider-man reboot comes out in theaters. They’ve previously released various arcs (like the venom saga) on dvd, but I haven’t seen any complete or sequential collections. Would be good of them to do! Ha ha… I was just surfing around and took a glimpse at these remarks. I can’t believe there’s still this much fascination. Thanks for crafting articles about this.